If only I could instruct various ingredients to assemble themselves into yum-looking dishes like this with a wave of my magic wand! (Hint, hint, Xmas wish list: MAGIC WAND) Saw these at the plastic food model store where I learned how to make tempura and lettuce last December. And in case you’re wondering about the one in the middle, rice mixed with a raw egg is to Japanese children what Lucky Charms are to American kids. 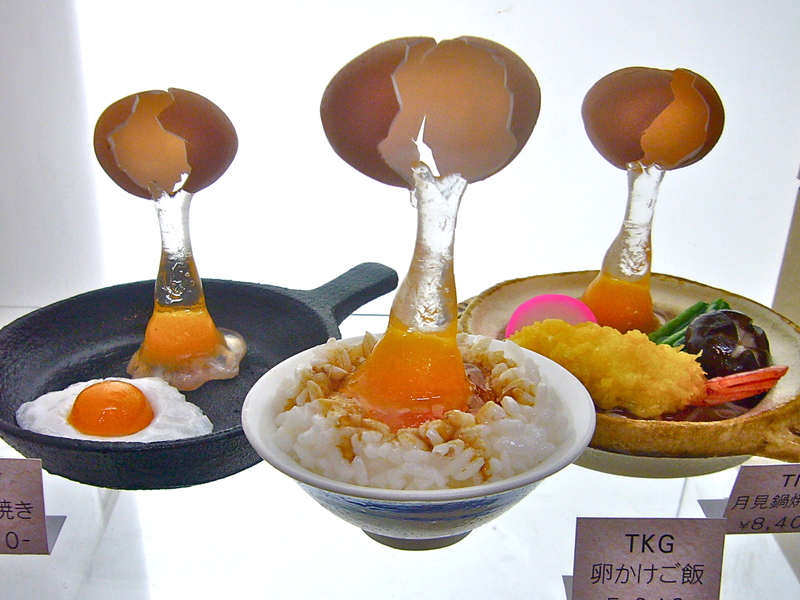 If you’d like to visit Kappabashi Street or make your own plastic food models the next time you’re in Tokyo, a map is on my website, The Tokyo Guide I Wish I’d Had. Wuugghh… I never could take the raw egg stuff. Can you? I don’t even know if eggs in Canada are OK to eat raw!